Every once in a while, the diet plans go out the window and people find themselves calling up the pizza delivery company or sitting at the drive-thru waiting for a bag of burgers. Binge eating and falling off the diet can be unhealthy and it can cause you to lose your motivation and feel guilty. Still, the taste buds sometimes feel as though they just need some pizza or burgers. What's a person to do? Find healthy alternatives! You have some at home options for making healthy burgers inside or outside on the grill. Instead of choosing ground meat, choose a healthier option such as lean ground chicken or turkey. Turkey burgers are popular and they taste great. Cut up some tomatoes, onions, lettuce and pickles, just as you would expect on a fast food burger. Use ketchup or a low fat version of mayonnaise or Thousand Island dressing. Only use this sparingly if at all. If you really want to indulge yourself, buy some turkey bacon and cook up a couple of strips for the burgers. It's a healthier alternative to regular bacon. When it comes to the bun, don't buy the regular white bread buns. You can find some healthier whole grain buns in the store. You might even want to forego the buns completely and wrap the burger in lettuce. Instead of ordering a pizza, make one at home. Making a pizza at home is much healthier, and it can be fun too. First, decide what you want on the pizza. Put on as many vegetables as you want – onions, olives, tomatoes, peppers, etc. You should only use low fat mozzarella if you decide to use cheese at all. When it comes to the meat, make sure that you choose something lean. Ground turkey is a good option, and so is chicken. You can bake the pizza right in your oven at home. 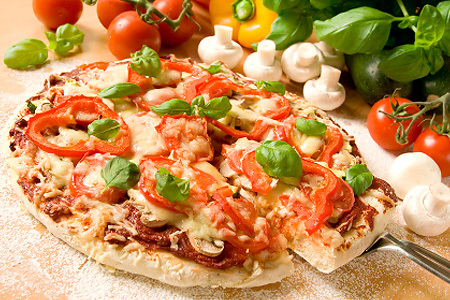 Most grocery stores today have premade pizza dough that you can simply roll out and shape. Wheat dough is available, and it is a better choice for the health conscious than the traditional white dough. Preheat your oven, put your toppings on the pizza and cook until it is golden brown. Make sure that you precook any meats that you put on the pizza. The above are just two of the many ways you can have some healthy alternatives to your favorite types of fast food. Consider making lean, fat free burritos and tacos. Make some sweet potato fries rather than regular fried potatoes. No matter your weakness when it comes to food, you should be able to find some simple to make alternatives that will have fewer calories and more nutrition. Even though these are healthier options, you still don't want to overeat! These dishes will still have more calories than what you usually eat on a diet. Eat reasonable portions and save some for leftovers the next day.